Banana blossom aka banana heart aka banana flower, is not an ingredient you would normally find in your local grocery store. But if you live near an Asian grocery store, you might see some fresh ones in the produce section. 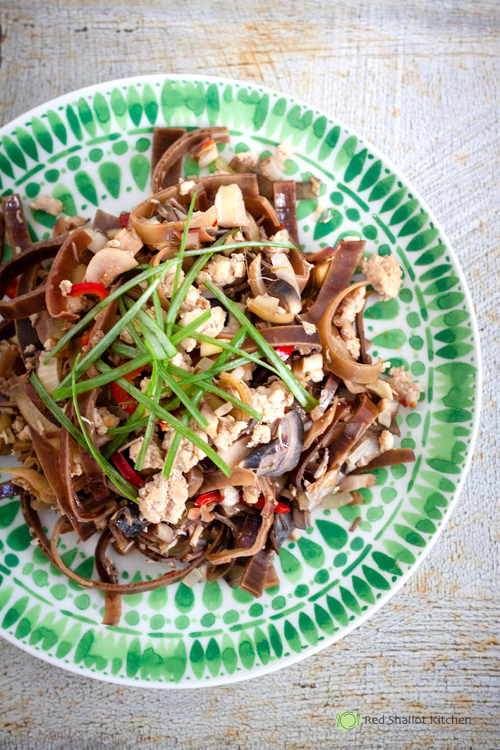 A widely popular ingredient in Southeast Asian and Indian cuisine, banana blossom's mild flavor works wonderfully in salad, stir-fry, or curry. The knowledge to prepare banana blossom for the dish is somehow crucial. Make sure you follow every step, so you don't end up with discolored blossom that leaves unpleasant bitter taste in your mouth. If you do it right, this is the delicious dish that might make more than one appearance at your dining table. In a large bowl, mix cold water and white vinegar, and set aside. Peel the tough purple outer layers of banana blossom until you reach the pinkish-creamy color part of the blossom. Split the blossom in half lengthwise, then slice crosswise as thinly as possible. Transfer banana blossom slices immediately to the bowl with vinegar water. Soak the blossom for 1 hour, up to 2 hours. This process will prevent the blossom from turning brown, and also will get rid of the bitterness. Drain and rinse with cold water before cooking. Heat olive oil in a large skillet over medium-high heat. Add onion, garlic, shrimp paste, Jalapeños, and lemongrass into the skillet and cook for a few minutes. Add ground chicken to the skillet, breaking up the chunks with the wooden spatula while stirring. Continue cooking until the chicken is crumbly and no longer pink. Add banana blossom and chicken stock into the chicken mixture. Season with salt and pepper. Continue cooking for about 5 to 10 minutes, until the blossom is tender and the stock is absorbed. Serve warm with steamed rice, if desired. Very good. you are the winner. Do not forget update new information regularly. thank ! Thank you for the wonderful information i lokok forward this great event and nice blog. Mother’s Day is celebrated for our family most special person our mother. Mother is a god gift for all people in the world. Every son/daughter is celebrated Mother’s Day for their mother; happy mothers day daughter they express their feelings, love, and joy with their mom. Mother’s Day is celebrated in all over the world on different days; it means Mothers Day Date is not same in all over the world. In most countries, Mother’s Day is celebrated second Sunday of month May. Mother’s Day was first celebrated in 1908 when Anna Jarvis held a memorial for her mother at St Andrew’s Methodist Church in Grafton, West Virginia. St Andrew’s Methodist Church now holds the International Mother’s Day Shrine. Whats Happening i’m new to this, I stumbled upon this I’ve found It absolutely helpful and it has aided me out loads. I’m hoping to contribute & help other customers like its helped me. Great job. Together with every little thing which seems to be developing within this specific area, many of your points of view happen to be quite refreshing. Nevertheless, I beg your pardon, but I do not subscribe to your entire plan, all be it radical none the less. It would seem to us that your commentary are not totally validated and in simple fact you are generally yourself not even totally convinced of the point. In any event I did appreciate reading it.